The 4 Mcclellan's: I can't believe I forgot!! We also bought a new car about 3 weeks ago. 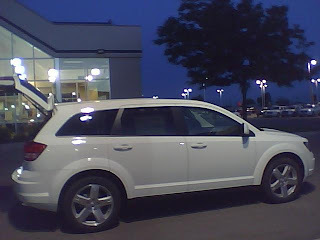 It's a brand new Dodge Journey and we love it! Wow! You are back to blogging! And you have some pretty big things to blog about - a marathon! That is so awesome! When I grow up, I wanna be like you!